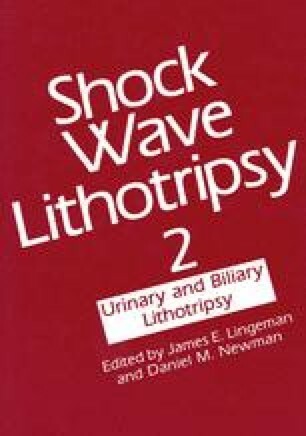 Pressure waves generated by lithotripters can cause injury to renal parenchymal cells. Disruption of or damage to renal tubular cells will result in release into urine of proteins which are not normally excreted. Four enzymes which are markers for renal tubular injury were measured in the urine specimens of 20 patients before treatment, one day after treatment, and seven days after treatment with extracorporeal shock wave lithotripsy (ESWL*). The enzymes assayed in relation to the creatinine contents of the specimens (enzyme index) were: N-acetyl-ß-d-glucosaminidase (NAG); ß-galactosidase (GAL); angiotensin converting enzyme (ACE) and gamma-glutamyl transferase (GGT). An increase in all four enzymes was found; the increase was significant for GAL and ACE in the 24-hour specimens. This increase was followed by a decrease (to pre-ESWL levels or lower) of all four enzymes by Day 7. Any injury to renal tubular tissue during ESWL appears to be limited in magnitude and brief in duration.